The City Coach Company’s long distance service Number 1 ran between Tylers Avenue, Southend, and London, Wood Green or Kentish Town. 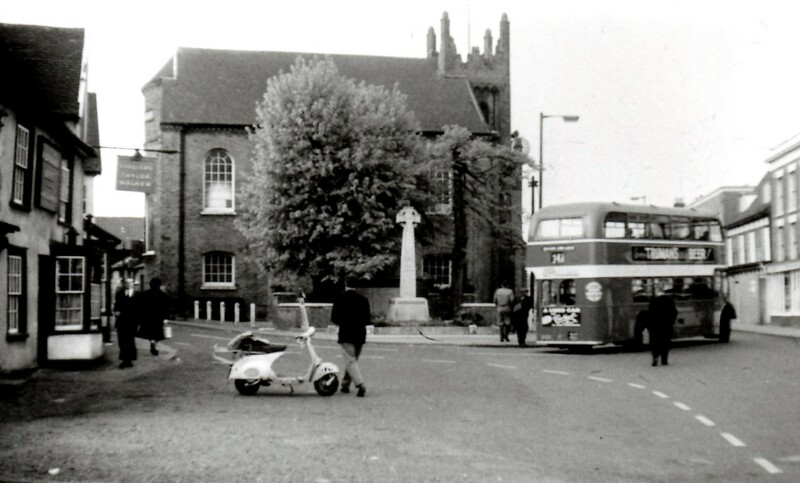 Originally buses going in both directions used part of the High Street, as far as the junction with Chapel Street. This being a wide junction then, they were able to use it to turn round and return through the High Street. Before the war this manoeuvre resulted in an accident in which a Mrs. Stringer, of Jacksons Lane, was fatally injured by a reversing bus.This service was then re-routed, missing out the High Street. This 1950’s picture shows a bus turning into the High Street. Also shown is the wide former market area in front of the Chequers, while Chapel Street on the left, is still two-way despite its narrow access. City’s LD1 LEV 917 was preserved at least until 1985. Unfortunately, it was in its final open top state. 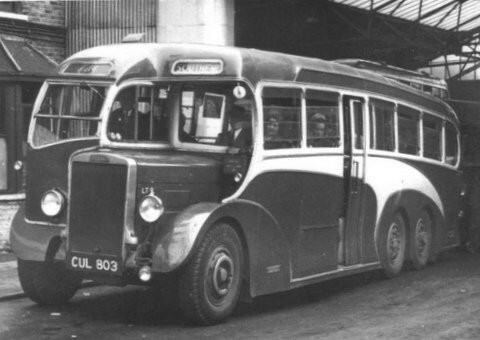 In it’s original condition, and like it’s sister bus LD2 LEV 918, it was built to a standard height of 14’6″ or thereabouts and, as such, wouldn’t pass under Shotgate railway bridge. This led to the situation that, as later double decks were to the lower height of 13’6″ and to avoid confusion with staff, all double decks operated via Battlesbridge there by avoiding any possible collision. I am currently trying to build a 1/76 scale model of one of the four wheel steering Leyland “Gnu” coaches, which I remember from my childhood. I rode on one once and can remember the very smooth sound and ride they gave. Ex-City drivers I worked with at the old Brentwood depot said they had a very good turn of speed on the open road by virtue of their overdrives; the trouble was stopping them!! Go to this page on the Wickford archive for a photo of the twin axle steering bus. I remember these and the rounded front one’s that had twin wheel front steering with a single rear axle. In the 1953/4 I was waiting at a bus stop opposite the King’s Head pub Great Burstead to go to Wickford secondary school, it was icy and one of the later type bus’s could not stop for me and ended up part way into Mill Road; a bus coming the other way stopped and waited till the City one reversed back. On another occasion, on my way home, i boarded an old City double decker and on asking what model it was I was told a J31. To this day i have never seen a photo of a double decker from City and I have been told no City buses have been preserved.